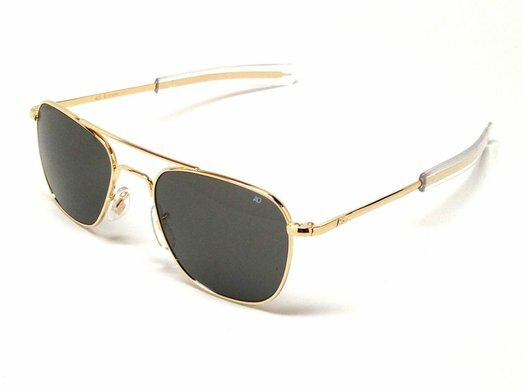 American Optics gold framed pilot sunglasses. Lens Sizes 52 and 57mm. Performance-tested sunglasses with classic aviator styling. The Original Pilot Sunglass has been a favorite of US military pilots for more than 40 years. Engineered to rigid military specifications and issued to millions of US soldiers, sailors, marines and airmen since 1958. The rugged and sturdy structure and high quality finishing of the steel alloy frame coupled with distortion free, toughened and polished True Color glass lens have made the AO Flight Gear Collection the standard bearer of all fine military sunglasses.